A group of model railroaders from the Prince William Model Railroad Club visited the layout today. They included Joe Funk, Jim Fletcher (Fletch), David Ruebsamen, Mike Burke, Tom Potthast, Pete LaGuardia, John Huntzinger. JD Drye, Joel Salmons and JB Weilepp (all three stayed out of the photos) stopped by to help run trains and eat some of Alicia's brownies. Later that evening Gerry stopped by to view progress on the road show and to discuss next steps. I installed the last turnout on the portable layout. All that remains are a couple guard rails and the track to the engine house and then all the track will be done. I am pleased to report that the turnouts are working just fine without the guard rails, but I will add them anyway. I started building the turntable. I opted to go with a common USMRR design. This style of turntable is visible in at least three different locations on USMRR lines. It may be a standard design, though I have not found any documentation that can prove that. The tricky part was designing the sloped pit. The photos show how I went about building it. Once the putty is dry, the pit will get a light coat of dirt and small rocks. One prototype photo shows brick lining the upper wall of the pit. I may do that here too as I think it looks neat. Well, new to me at least. The Huntington Library in California recently updated their website with a collection of Andrew Russell photos that were in the collection of J.B. Clough. 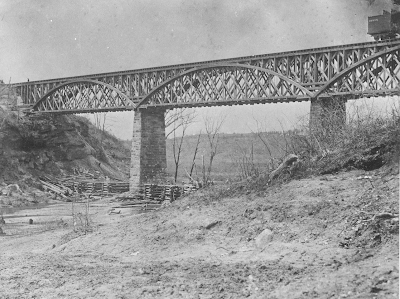 Clough was the chief engineer on the USMRR Aquia Line and others. I mentioned him in a blog posts here, here and here. Of the new photos in this collection were several showing engines by the Alexandria roundhouse and a new view of the Potomac Creek Bridge. The freight car in the upper corner is interesting, but otherwise the photo did not provide any new significant information. It does show the rock face under the bridge very clearly. By the look of the terrain, I believe that is the southern abutment. So this photo is looking west. It is fun when you discover some new material. If you are wondering why no there were no blog updates over the weekend, I was on a trip to Cresson, PA to railfan with some NTRAK friends. This trip has become an annual rite to celebrate Jake's birthday. He likes it cold and snowy and he got his wish. It was frigid, but we had fun. These videos give you an idea of the conditions we had. to put down scenery, which will be happening soon. Gerry came up for a Road Show work session and we got a fair amount done. He finished laying the track on the bridge section and then drove spikes elsewhere on the layout. He was curious and counted the ties on the layout and came up with 750. So that means we'll need about 3,000 spikes. I need to order more but thankfully Gerry brought a fresh supply. In the mean time I laid in two more turnouts on the shipyard section. That leaves just one turnout and the turntable, then all the track will be done. three switch stands earlier in the week. Later in the evening we ran a test train and everything worked quite well. I installed three of the planned six turnouts on the road show layout this weekend. It takes about 3 to four hours to install each turnout including making the switch stand. Three more turnouts and the turntable and the track will be done. There is no wiring needed as we will be running battery equipped locos, though I may add recharge feeders to the engine terminal tracks so the engines parked there can be recharged. Then it is scenery and structures. Depot siding. The red brick building is an O Scale kit that might be a quick and easy post office. Andy at Train Troll sent me a note to say he was beginning work on the O Scale packet boat. This is the HO model. 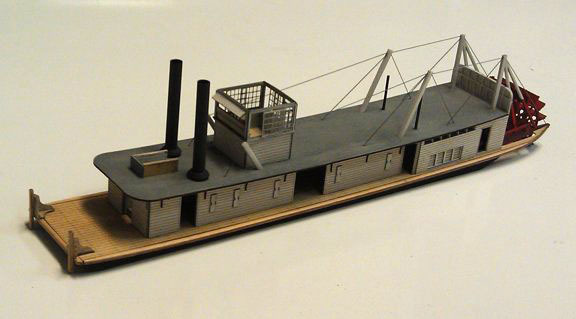 The O Scale model will have slight differences as it is a packet boat while the HO model is a tow boat. Yes, it's hard to believe that is has been four years since I started the civil war model railroad project. I better be careful as this layout is going to take longer to build than the civil war lasted. My helpers and I have got a lot done over those years, but there still is a fair amount of work to go. All the little side projects have not helped with layout progress, but they have kept things interesting. 2. build the road show in time for a debut at the NMRA National Convention in Atlanta. The first objective is not quite completed. The layout is finished from Falmouth to Potomac Creek, with some detailing needed (is detailing ever finished?). From Potomac Creek to Brooke I have to build three more structures, lots of detailing, some backdrop painting and then room finishing. The Aquia Landing area has all the benchwork and backdrops, but track has not started. The second objective is well on the way. The road show should be ready by the deadline. I will be making some changes to my priorities in 2013 as I shut down some things and start up others. But more on those later. In the meantime, work on the layout will progress with priority to the road show first, then the home layout second. US visitors dominate about 5 to 1 over foreign visitors. Of the foreign visitors Canada leads the way, ayy! Thanks for following along. I hope you enjoy the blog as much as I do writing it.